SEO versus PPC is the great debate when it comes to search engine marketing strategies. SEO (Search Engine Optimization) is the use of keywords woven into online content in an effort to organically drive traffic to a given website. By saturating website or social media content with keywords, search engines will recognize the site and rank it higher on the search results page. Keep in mind, search engines are no dummies, they will crawl your page to make sure its content is relevant and substantial, so having an expert copywriter is crucial. PPC is much different. PPC (Pay Per Click) allows you to create an ad and bid on keywords in order to have your ad appear when those words are part of a user’s query. It is called “pay per click” because you pay the approved bid amount each time your ad is clicked on by a user. There are pros and cons to each initiative. Depending on your brand, website content and campaign, one may work better than the other. Below we’ve broken down the basics of SEO and PPC, in order to help you decide which will work best for your organization. SEO is a more creative process than PPC. Agencies will attempt to saturate blog posts, social media and website content with keywords to try and drive traffic to their site. Those that choose SEO over PPC are more focused on long term goals. This is because SEO takes time and tweaking to get the greatest results. Up to 80% of traffic to a given website can be driven by quality SEO. SEO is best used for websites that are rich in content. 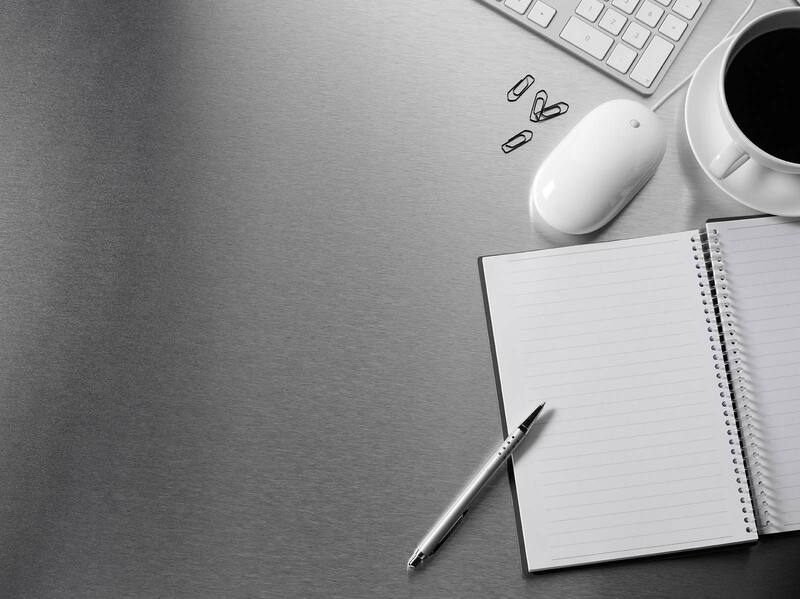 Copywriters can then utilize a list of keywords to include in the site’s copy. SEO allows for consistent results over a long period of time. Once you have established your page organically as a top site on the search results page, you are likely to stay there for a while. The ability to maintain your position as a top site on the first page also allows you to become a trusted authority on the specified topic and sustain traffic to your website by building a reliable reputation. PPC has a more analytical approach than organic optimization. Agencies that use PPC will look for patterns to select the most influential keywords. Those that utilize PPC tend to be more focused on short term goals. They look for immediate results which are easily attained through the use of PPC. The moment your ad and bid is approved, your ad will be placed in front of millions of users and traffic results are almost instant. Less than 25% of a given website’s traffic is attributed to PPC. PPC works well with campaigns that are time sensitive, such as product launches, seasonal or holiday promotions and event marketing. PPC allows you to narrow your reach to selected demographics. 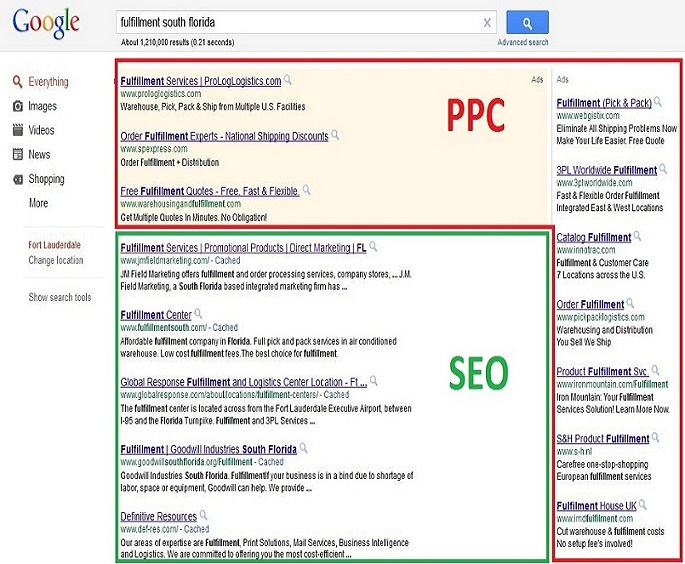 PPC offers premium positioning (refer to the image below). With PPC your ad is guaranteed to appear on the first search results page and above the organic search results. In the image above you’ll notice J.M. Field Marketing is the top ranked SEO website by Google when we searched “fulfillment south Florida”. Through the use of keywords in our website copy, as well as including relevant and intelligent content on our fulfillment pages, SEO has helped us build a positive reputation. We have maintained that reputation through quality service in fulfillment and marketing services and aim to continue on through the years as one of the industry leaders.